Want to see this compressor in action? Watch our video titled How To Inflate RV Tires The Easy Way or see us blow out our water lines for the winter: Winterizing RV Water Lines with Compressed Air. 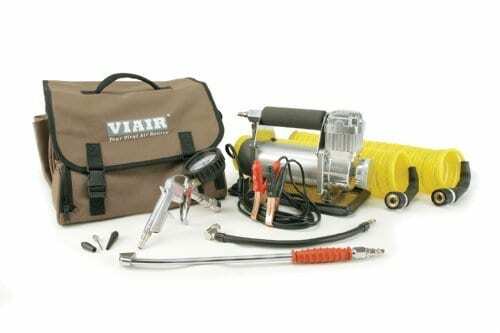 Keep your tires inflated on your RV, trailer, or just about anything else no matter where you go with the Viair 400P-RV Automatic Portable 12-Volt, 150 PSI Air Compressor Kit. This 12-volt air compressor hooks up to your vehicle’s battery, and with its 150 PSI capacity can inflate 35-inch tires to 30 PSI in less than 5 minutes. This compressor can operate for 40 minutes at a time so you get the job done. This kit comes with everything you need for an air compressor on the go. Besides the compressor itself, it includes a carry bag, inflation gun with pressure gauge, 30-foot hose, 30-foot hose extension, sand tray, set of dual battery clamps, 8-foot power cable, inflation tips kit, and fuse holder. No matter where the road takes you, make sure your wheels are good to go with the Viair 400P-RV Automatic Portable 12-Volt, 150 PSI Air Compressor Kit. 12 VOLT – 150PSI Max Working Pressure, engine must be running during use. Powered direct to the car battery with alligator clamps. Comes with a tire inflation gun and gauge, build in pressure switch, air hose, RV accessories and a carrying case. Great for adjusting tire pressure on RVs and trailers.